Everyday, our eardrums take a beating. From loud music to sirens to planes flying overhead, our eardrums and hair cells within the ear can become damaged when exposed to high decibels. Once a person loses their hearing, it is gone forever. 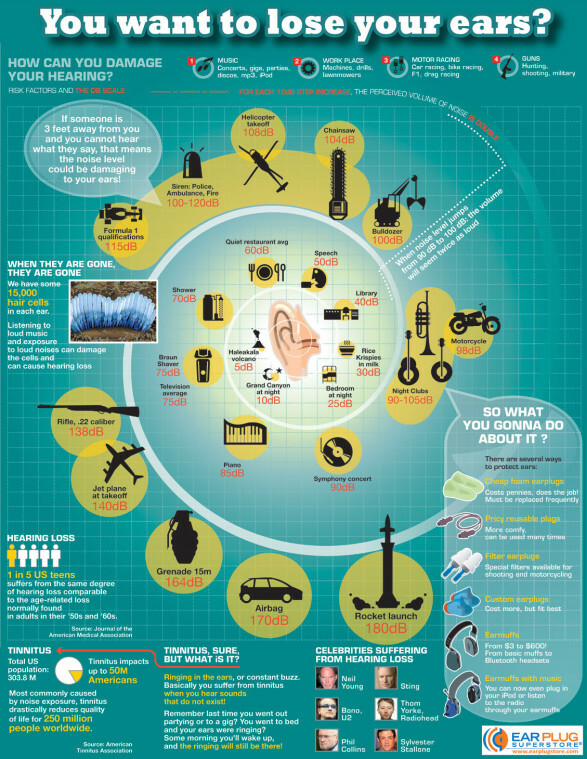 Here are some shocking facts about hearing loss and what you can do to prevent it. This entry was posted in Healthcare Issues, Hearing, Infographic and tagged Decibels, Ear, Healthcare Issues, Hearing, Hearing Loss, Infographic, Tinnitus. Bookmark the permalink.